Maj. Nathaniel Michler, signed CDV sold by Cowan's Auctions 2015. No. 11. Report of Maj. Nathaniel Michler, Corps of Engineers, U. S. Army, Acting Chief Engineer. HDQRs. ARMY OF THE POTOMAC, ENGINEER DEPARTMENT, October 20, 1864. Official Records, S 1 - Vol. 36 (Part I), 291-295. GENERAL: An extract from Special Orders, No. 209, headquarters Army of the Potomac, August 5, 1864, directs corps and other independent commanders to report the part taken by their troops in the several operations of the campaign from the crossing of the Rapidan to the assault on the enemy’s position in front of Petersburg, July 30. In the absence of Maj. J. C. Duane, U. S. Corps of Engineers, who during the period above specified acted as chief engineer of this army, I have the honor to forward the accompanying report addressed to him by Capt. George H. Mendell, commanding the battalion of U. S. Engineers, dated August 5, and that of Lieut. Col. Ira Spaulding, commanding detachment Fiftieth New York Volunteer Engineers, dated August 30, setting forth in detail the operations of their respective commands during the period above specified. These reports, in addition to the interesting information contained concerning the passage of a large army by pontoon bridges over the several rivers encountered on its march, and the facility, ease, and promptness with which a thoroughly trained body of engineer troops can accomplish such important duties, also bear testimony to the zeal, energy, and ability displayed by both officers and men, and to the important services rendered by this arm of the service, not only during the weary marches of a long and trying campaign, but also in the preparation and execution of the more tedious operations of the siege. In justice to those attached to the engineer party at the headquarters of the army, both officers and civil assistants, and to show the nature and extent of the labors performed by them, I beg leave to submit a brief synopsis of the duties connected with the topographical department, the special charge of which had been for several months previous to and during the campaign under my immediate care and direction. In addition I would wish to state the different occasions on which the several officers of engineers on duty with the army were detailed from their respective commands, and under personal instructions from the chief engineer performed valuable professional labors. As that officer is not here to attend to what would no doubt prove a pleasing and interesting duty to him, and one which he is so well able to perform, having been compelled to leave the field in consequence of partial sunstroke received the very last day of the period covered by this report, it becomes necessary for me to undertake the preparation of a general summary of the operations of the department. During the winter months previous to the opening of the spring campaign, from the 10th of December to the 1st of May, a large number of original drawings of campaign maps were prepared under my direction (twenty-nine sheets in all), comprising the country from Gettysburg south to Petersburg, and from the Chesapeake Bay as far west as Lexington, in readiness for the movement of the army in whatever direction it might march after breaking up the winter camps near the Rappahannock River and along the Orange and Alexandria Railroad. The scale adopted was 1 mile to the inch, being the most convenient by which to make any addition or corrections on the different sheets, the distances being more readily measured without instruments. These maps were compiled from actual surveys and reconnaissances made by the officers and assistants of the engineer department on duty with the army at various times, both during the previous movements of the troops in other portions of the country, and throughout the more recent operations between the Rapidan and Bull Run, and by such additional matter as could be obtained from the best authorities, both State and country. In searching for the latter, the series of maps prepared by the Bureau of Topographical Engineers of the War Department proved of the utmost utility. The copies furnished by the U. S. Coast Survey of the maps of the several rivers likely to be encountered, such as the Rappahannock, the York and the James, and the chart of the Chesapeake Bay, were also invaluable. When prepared, the sheets were successively forwarded to the Bureau of Engineers at Washington, with the request to have them either photographed, lithographed, or engraved. By the time the army was ready to move, they were distributed for general use, each of them covering an area of 875 square miles, and subdivided into 5 miles square for the sake of easy reference. In addition to these detailed maps, the following general ones were distributed among the officers of the command: Central Virginia, compiled in the Bureau of Topographical Engineers of the War Department, scale 1 : 350,000 inch, and part of the map of the Military Department of Southeast Virginia and Fort Monroe, compiled in the Bureau of Topographical Engineers of the War Department, scale 1 : 200,000 inch. The Bureau also kindly furnished others for reference, viz: Part of the map of the Military Department of Southeast Virginia and Fort Monroe, showing the approaches to Richmond and Petersburg, scale 1 : 80,000 inch, and Nos. 1, 2, and 3 of the Peninsular Campaign maps, together with the Henrico County map, the former engraved, and the two latter photographed for the use of the armies operating against Richmond. The detailed map of Northeast Virginia and vicinity of Washington, scale 1 inch to the mile, compiled under the direction of Maj. A. W. Whipple, U. S. Topographical Engineers, was also placed at the disposal of this department. At different intervals during the several months previous to the opening of the spring campaign a great many reconnaissances and surveys had been pushed as far as the different fords of the Rapidan and that section of the country had become accurately known. The movements of the army in November and December, 1863, between the Rapidan and Mine Run, had also furnished some very important information which subsequently proved of great value. Beyond the latter narrow strip of local knowledge along the Rapidan, the experience gained in the memorable campaign of the Army of the Potomac during the months of May and June of 1864 showed very conclusively that however well the only accessible maps might have served the purposes of general knowledge, still they furnish but little of that detailed information so necessary in selecting and ordering the different routes of marching columns, and were too decidedly deficient in accuracy and detail to enable a general to maneuver with certainty his troops in the face of a brave and ever- watchful enemy. This was more especially the case as the country in itself proved to be of the worst and most impracticable character a most difficult one for executing any combined movement. This may appear strange to those who reflect that the Commonwealth of Virginia is among the oldest of the States of the Union. They necessarily conclude that her archives should contain the most perfect geographical and topographical material for mapping her extensive domains. The proof that such has not been the case, and that this great want has been felt by her own military officers, is shown by the large surveying parties kept by them constantly in the field. Some of the results of their labors have lately fallen into my hands, a few excellent maps having been captured which bear evidence of very recent construction. On the face of them not only appear their familiar names, but the distinguishing peculiarities of workmanship of assistants employed on different Government surveys at the very commencement of the war. Although the enemy has no doubt suffered at times from want of accurate maps, still he at all times possessed a superior knowledge of the country, and could always obtain reliable guides from among its inhabitants, thus affording him a very great advantage over his adversary. In order to be able to cope with [the enemy] with anything like equal advantage it soon became apparent that the difficulties to which reference has been made would not only have to be overcome by gathering material with the onward march of the army, but that the desired information would have to be obtained in anticipation of any move. To accomplish this the officers and assistants of my party were kept constantly occupied both day and night; they were not only called upon to prepare the much needed maps with the detailed corrections, but also in the entire absence of reliable guides to act as such to the different columns, either as they moved along their respective routes of march or while maneuvering for favorable positions previous to an attack. Maj. John E. Weiss, commissioned by the Governor of the State of Kentucky, acted as my principal assistant, and Capt. W. H. Paine, additional aide-de-camp, was also attached to the Engineer Department as an assistant. In addition to these there were seven civil assistants, besides several men detailed from the ranks to act in various capacities. The names of the former are Mr. Ferd. Theilkuhl, W. Burchard, Franz Schumann, E. Myers, L. C. Oswell, George L. Crane, and John H. Mullen. Some of them had been connected for a long time with the Army of the Potomac, and had gained great experience in making rapid reconnaissances and surveys, and in executing topographical sketches. Their duties commenced immediately after crossing the Rapidan, the surveys being connected with those previously extended to that river, and progressed without interruption or rest until the army arrived in front of Petersburg; nor did they then cease, but have continued along without any interruption to the present time. Each and every road within the lines of the army was examined and surveyed, and their researches were pushed as far to the front and on the flanks as it was compatible with safety to go without incurring any unnecessary risk of capture. The notes were immediately plotted and the maps compiled and at once photographed for the use of the officers of the command. In addition to the general topographical features of the country being represented, the respective lines of battle taken up at different times and at various localities were located. These were executed under the fire of the sharpshooters, and as well as the constant daily fighting would permit. As rapidly as any new information could be procured new editions of the maps would be prepared and photographed, and widely distributed. In this way, from the crossing of the Rapidan on the 4th of May to the explosion of the mine on the 30th of July, several editions of each of eleven separate sheets were arranged and issued, comprising surveys which cover an area of 737 square miles. In addition to the surveys already referred to there were several others not embraced on the photograph sketches, comprising one from the Germanna Ford to Petersburg, taken by the headquarters train of wagons along which the measurements were made by an odometer, a distance of over 179 miles, and also those made in company with the cavalry expeditions under Major-General Sheridan, the first from Chancellorsville to Haxall’s Lauding on the James River, and the last from Cold Harbor to Trevilian Station on the Virginia Central road and back to the White House, in the aggregate a distance of 310 miles. These actual surveys have since been compiled with information obtained from maps captured from the enemy, and the original series of campaign sheets corrected by this additional matter. Six sheets have thus been improved upon, including those styled Culpeper, Chancellorsville, Fredericksburg, Hanover, Richmond, and Petersburg, the originals of the first five of which are in the hands of the engraver, having been previously photographed for any immediate use. ​On the 9th of July, the date of the order directing that the operations of this army against the intrenched position of the enemy defending Petersburg will be by regular approaches, a trigonometrical survey of the environs of that city was commenced, showing the topographical features of the country and the positions of the intrenched lines of both armies, and by the 30th of the same month was far advanced. During the progress of the siege this map proved of the greatest importance, and constant reference was made to it. In closing this part of the report in relation to the labors of the topographical department of the army during the period called for by the major-general commanding, it may be of interest to know that over 1,300 miles of actual surveys were made; that more than 1,200 maps were issued to the army previous to taking up the line of march across the Rapidan, and over 1,600 photograph sketches between that date and the 30th of July. It would not be just to my assistants to refrain from expressing the appreciation I entertain for the unwavering and cheerful energy at all times displayed by them in the performance of their duties. The amount and accuracy of the work accomplished by them is sufficient evidence of their activity and ability. Exposed night and day to all the hardships and dangers of the campaign, it was under the most trying circumstances that their duties were performed. The usual conveniences afforded persons so employed were necessarily denied to them, but they were ever ready for any emergency and prompt to execute any instructions. The particular attention of the commanding general is called to the extent and difficulty of the labors performed by them. The silent and arduous labors of the engineer, upon which depends to such a great extent the success of a campaign, are too apt to be forgotten and overshadowed by the brilliancy of the noble and brave deeds of other arms of the service. In this report it will be unnecessary to enter into great detail upon the many various engineering operations of the campaign aside from the one branch of duty already alluded to, particularly as some of them have been elaborately presented in accompanying documents, nor will an accurate description of the country passed over be attempted, as it will no doubt be more vividly pictured by others. The portfolio of maps which is appended to this paper must for the present exhibit the lines of operations of the army and the localities of the various fields of battle until additional time and more advantageous circumstances permit the perfecting of them. Exact and beautiful drawings of the several points of interest are in course of construction. LC lva00194. 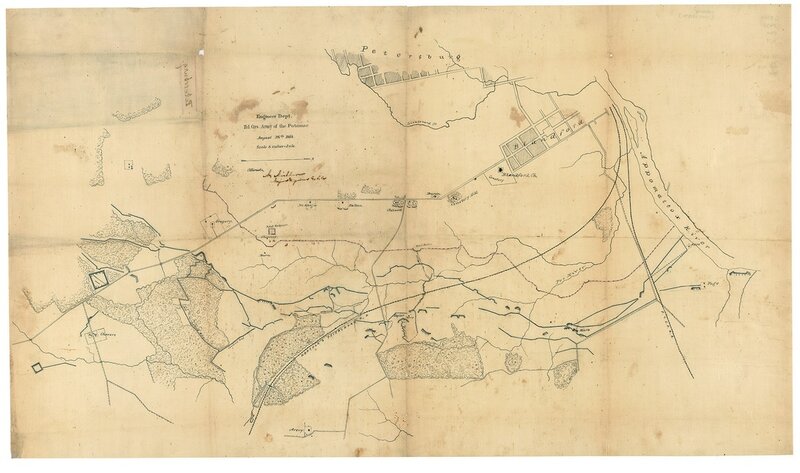 [Map of the environs of Petersburg from the Appomattox River to the Jerusalem Plank Road showing entrenchments occupied by Federal forces, August 28, 1864] Engineer Department, Hd. Qrs. Army of the Potomac. In the topographical department I directed my principal assistant, Major Weyss, assisted by Mr. Theilkuhl, to survey the new line of works extending from Fort Dushane, on the Weldon railroad, to Fort Bross, near the Blackwater Swamp. The survey has been completed and plotted and added to the large 8-inch map of the operations in front of Petersbnrg. The new line from Fort Sedgwick to Fort Haskell was also surveyed yesterday. The construction and drawing of the large map of Petersburg have been progressing with every prospect of completing it by the end of the next week. Detailed measurements and sketches preliminary to preparing accurate plans and profiles have been made within the last few days of Forts Sedgwick, Wadsworth, Rice, Alexander Hays, Dushane, Howard, Meikel, Morton, and Haskell. Tracings from the original drawings have been made, and are now respectfully submitted with this report, of Forts Davis and Prescott (redoubts on the plank road); of the eighteen- gun battery (now part of Fort Sedgwick); of the 10-inch mortar battery (now forming one face of Fort Rice), and of the field battery for eighteen guns (located near the Norfolk railroad, but recently demolished). A Map of Dinwiddie County (scale one inch to the mile) has also been completed and photographed and copies forwarded for the use of the lieutenant-general. Campaign maps (scale one inch to the mile) are also in course of compilation from the Rapidan to the Appomattox. The Culpeper, Spotsylvania Court-House, and Fredericksburg sheets are already finished, and those of Hanover Court-House, Richmond, and Petersburg are far advanced toward completion; the construction and compilation have been going on during the week. A copy of section of photograph map captured from the enemy, showing the country adjacent to Richmond and lines of defensive works surrounding the city, is also being made in the office; part of it is already completed and photographed, and the other part will probably be finished in the course of several days. A sketch (two inches to the mile) giving the relative positions of the different forts, redoubts, and batteries, and the infantry parapets connecting them, of the entire line from the Appomattox to the Blackwater Swamp has just been prepared to show the names, numbers, or letters of the respective works. Sign-boards have also been painted to designate each fort and battery. A list has been prepared to be printed, giving the armament, garrison, name, and locality of each work. The line is sixteen miles in length, and along it have been constructed or are in course of construction nineteen forts and redoubts and forty-one batteries. I have the honor to be, colonel, very respectfully, your obedient servant, N. MICHLER. In the topographical department I have the honor to report that during the week my principal assistant, Major Weyss, assisted by Mr. Theilkuhl, was directed to survey the line of the military railroad from its junction with the City Point and Petersburg road to that of the Weldon road; of the corduroy road between the Jerusalem plank road near Jones and the Globe Tavern, and of several shorter corduroy roads in the same neighborhood. These surveys, together with that of the new line between Forts Sedgwick and Haskell, have been plotted and added to the detailed map (scale eight inches to the mile), which has been for some time in course of preparation, showing the different lines occupied by the U. S. forces in front of Petersburg, together with the general topographical features of the country. This map is now completed, with the exception of the lettering. It comprises the entire line from the Appomattox to the Weldon road, and thence back to the Blackwater Swamp. It is my intention to have it photographed for immediate distribution, and subsequently engraved, should my views be entertained by the commanding general. Drawings of the plans and profiles are now being made of Forts Sedgwick, Wadsworth, Rice, Alexander Hays, Dushane, Howard, Meikel, Morton, and Haskell, by four assistants detailed from the Engineer Battalion. When finished, copies will be respectfully submitted. The line from Fort Haskell to Fort McGilvery has been undergoing some alterations. As soon as it is definitely traced a survey will be made of it, and plans prepared of the latter fort and Fort Stedman. Several drawings of batteries are also being constructed. Captain Paine has continued during the week the reconnaissance of the roads toward the south, particularly of those along the line of cavalry pickets between the Blackwater and the James, and has obtained some additional information. Through the kindness of General Kautz several new roads have been laid down on the Petersburg sheet, one of the series of the campaign maps. This sheet has been partly finished from actual surveys as far as I have been able to extend them for the present, and the rest compiled from various authorities. Two photograph copies, each united with one of the Dinwiddie Court-House sheets, are respectfully forwarded with this report. On one the present line is sketched and colored in blue. The Hanover Court-House has also just been completed. This is also one of the series of campaign maps. Together with the Culpeper, Spotsylvania Court-House, and Fredericksburg sheets, it has been forwarded to New York to be engraved. The only one of the series of campaign maps remaining incomplete is the Richmond sheet. With the exception of the lettering this is also ready to be engraved. The northern part of the Copy of section of photograph map, captured from the enemy, & c., will be completed in one or two days and immediately forwarded to be photographed. The Sketch showing the positions of the forts and batteries has been photographed, and the List of field-works, their armaments and garrisons, prepared by this department and referred to in my last report, has been printed and copies furnished the adjutant-general at these headquarters for distribution. During the last two days the names and numbers of the forts and batteries have been designated by suitable signboards. I have the honor to be, colonel, very respectfully, your obedient servant, N. MICHLER, Major of Engineers. In the topographical department the assistants have been engaged in making accurate surveys of the country west of the Weldon railroad as far out as the cavalry picket-line and of the newly intrenched lines. Measurements were also made of the different new redoubts. The former are being plotted, and drawings made of the latter. The ground has also been examined between the present terminus of the military railroad, near the Yellow Tavern, and the Pegram house, for the purpose of extending that road. Surveys have been made of the proposed route. A base has been cut in front of Fort Howard, along the line of infantry pickets and a triangulation made to locate the position of some points of the main works of the enemy in front of Petersburg. A map of these different surveys is in course of compilation. Tracings are also being made of the detailed drawings of the different field-works recently constructed, and also of those along the first and main line occupied by the enemy in front of Petersburg upon the advance of the army in June, for the purpose of photographing them. The lettering on the Richmond sheet, one of the series of campaign maps, is still progressing, but owing to other miscellaneous business requiring the attention of the assistant engaged upon it, will not be completed until the end of the week. The Copy of section of photograph map captured from the enemy, showing country adjacent to Richmond and lines of defensive works surrounding the city has been photographed and copies sent during the week for the use of the lieutenant-general. Other sections are being copied, but have been delayed in consequence of the many calls made at different times for the original. Inspections of the different works were frequently made during the week, and it is with great satisfaction that I have to report that all have been constructed in the most satisfactory manner and with great rapidity. I am, colonel, very respectfully, your obedient servant, N. MICHLER, Major of Engineers, U. S. Army, Acting Chief Engineer. In the topographical department the triangulation of the country west of the railroad and the linear measurements of the lines have been advancing under the immediate direction of my principal assistant, Major Weyss, and is now very nearly finished. The map of the same is now being prepared. The dimensions of the different works have already been accurately measured and drawings are being made of them. Tracings are also being prepared from which to photograph them. The Richmond campaign sheet, compiled from actual surveys and from other authorities, is now very nearly ready for the photographer and engraver; lettering not yet being complete. The copying of the different sections of the Photograph map, captured from the enemy, showing the country adjacent to Richmond and lines of defensive works surrounding the city, is still progressing toward completion. The “Map of the environs of Petersburg from the Appomattox River to the Weldon railroad, showing the position of the intrenched lines,” has been forwarded to Washington to be photographed, but as yet no copies have been received. In conclusion, I have the honor to state that the whole line now occupied by the Army of the Potomac is almost entirely constructed and in a defensible condition. Some minor details among the interior arrangements of the different redoubts still require additional work, but are fast being attended to. I am, colonel, very respectfully, your obedient servant, N. MICHLER, Major of Engineers, U. S. Army, Acting Chief Engineer. In the topographical department, the assistants have been engaged in extending the surveys beyond the Weldon railroad, and a map of the new line is in course of compilation. The Richmond campaign sheet is completed, with the exception of the lettering, and copies of the additional sections of the map captured from the enemy are being made. During the move to the Boydton road the several roads followed by the moving columns of troops have been surveyed, and the topographical features of the country were sketched. A map is being prepared of the country passed over. Captain Paine, aide-de-camp, was directed to guide the Second Corps during the movement, remaining until it was withdrawn from the position occupied by it on the plank road. I am, colonel, very respectfully, your obedient servant, N. MICHLER, Major Engineers, Acting Chief Engineer.